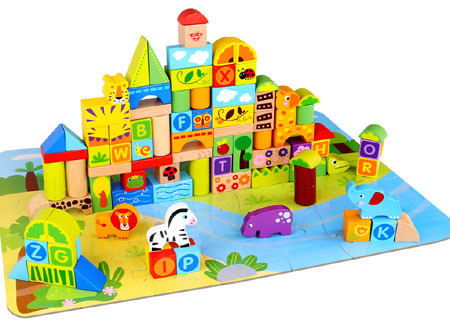 Wooden Blocks Jungle 135 Pieces is a beautiful jungle paradise in a box just waiting to be brought to life by little hands. There is a wonderful selection of blocks in different shapes and patterns to make all sorts of designs. No two adventures will be the same and there are also wild animals to add to your stories. Among the blocks is an alphabet set so you can incorporate words into your building. A fantastic set with many opportunities that will spark imagination and story telling . We like this because: "A big set providing lots of blocks and multiple building opportunities "